Greetings from the Roslindale Farmers Market! We are taking over FMC’s Instagram for the duration of two weeks to share with you a look into our market. Our market is loved by our community – and for good reason! As a new “visitor” at our market, there are a few things you ought to know to fully appreciate the market that surrounds you. Located in the heart of Roslindale Village, the Roslindale Village Farmers Market was created 34 years ago by a select few farmers like MacArthur farm who needed a place to sell their produce right out of the beds of their trucks. Over the years, management of the market has been taken over by Roslindale Village Main Streets; an organization founded in 1995 by Boston’s longest serving mayor, Thomas Menino. Whether you are a long-time faithful, a local who is finally making the trip to see what all the excitement is about, or one of the many who has traveled from another part of the city, thanks to your support, our market has grown over the many years to resemble a village festival with over 30 vendors a day, live music, kids activities, wellness series, and all kinds of special events and guests. Walking around the market you’ll encounter farm fresh produce within a 200 mile radius of Adams Park, we also have a variety of animal products offered and an always rotating group of vendors who specialize in prepared food, spices and numerous handcrafts, all of which make great gifts and will surely be the hit of any party you bring them to. One of Roslindale Village Main Streets biggest prides is our engagement and communication with the community. Residents keep an eye out for one of our postcards or flyers that pop up all over town, they also hear about market happenings through our Instagram, Facebook page, and our weekly newsletter that reaches over 4,000 people. If you ask our regular market shoppers, they’ll tell you instantly that it is the excitement of meeting their neighbors, and participating in all the extra events that keeps them coming back every Saturday. Throughout a season you’ll encounter volunteer organized events such as “bike day” (with free repairs) and our annual Halloween costume contest (we let dogs participate as well). One of the best parts of the market is this happens nearly every Saturday of the year. If you happen to come by in the colder months, we can be found in one of the nearby event halls keeping the farm fresh food coming. 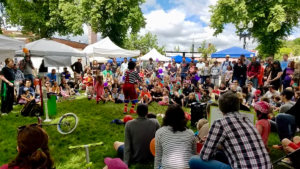 This past summer we even had enough support to close down adjoining Poplar street on opening day to kick off the summer off with food trucks, games and fun. We aim for our market to be a brilliant community asset. Previously we’ve partnered with City Mission’s COAT BOSTON to run coat drives, and ask our vendors to donate any extra food to organizations like the Roslindale House and Haley House. We are also proud to support the SNAP/EBT users get fresh wholesome food by matching fruit and vegetable purchases through the HIP program. Since our market is nearly entirely organized and run by volunteers, we do as much as we can to be noticed as little as possible, letting the community have direct connections with the farmers providing their nutrition. And if you ever need any inspiration on how to use some of the awesome ingredients from your trip, stop by one of the many restaurants that surround the park and experience some incredible, multi-cultural cuisine. With all these moving parts our market has become part of the heartbeat of Roslindale. Although we run into the usual problems of increased parking demand, traffic re-routes, and the always unpredictable New England weather, our volunteers and staff have worked tirelessly with city officials and planning departments to make market Saturday’s the best they can be. We are always excited to see new faces at the market, and hope to see you there. We are so excited to take over FMC’s Instagram account because our market has proven so integral to the social life and nutritional health of our neighborhood that we can’t help ourselves but share the fun with our citywide neighbors.